After reading Majdmum Risk, my Iriend Jason England developed an excellent impromptu method using a bottom deal. I've combined his ideas with a couple oi my own to produce the following alternative handling. Hand the deck out for shuffling. 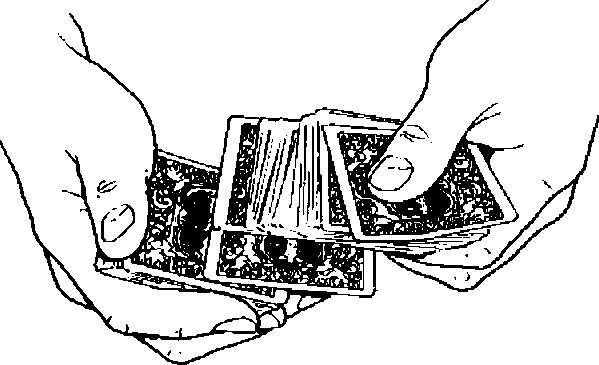 When it's returned, spread the cards from hand to hand as you ask a spectator to touch the back of one of them. Spread the cards slowly and evenly, ensuring chat there are several cards widely spread at all times. Thus, when the spectator touches a card, a couple of cards above it will also be spread. You then display the selection and switch it out using a minor variation of Larry Jennings' Open Control. Break the spread above the selected card. At the same time, push the selection farther to the right with your thumb and allow all the cards below it to square into dealing position. Draw the right-hand cards inward so that you can take the selection under the spread but outjogged for about a third oi its length. The left edge of the selected card should align with the left edge of the double at the bottom of the spread. (See illustration 3.). Ask the spectator and the rest of the audience to remember the card. Your forefinger now pulls the selected card square with the packet as you tilt the cards downward. 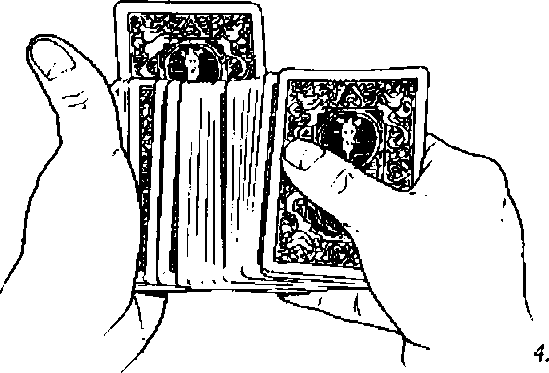 (There is a slight tendency for this action to push the second card from the top downward. Maintaining pressure on the sides of the packet wili eliminate this problem.) At the same time, tilt the left hand downward to bring the top of the packet into view. Time it so that the top of the packet comes into view just as the card is squared with the pack. Follow through by thumbing the card onto the table. With proper timing you'll get a good visual retention illusion of dealing off the selection. 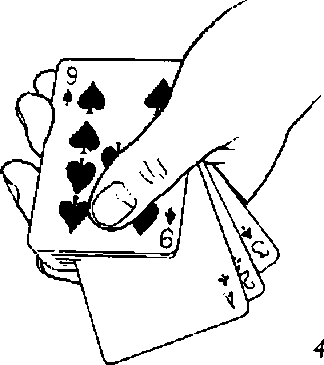 Reassemble the deck by placing the right-hand cards under the left-hand cards, (The selected card is now second from the top of the deck,) Take the deck in your right hand in Biddle grip. Dribble the cards slowly onto the table. As you do so, explain that you Ye going to repeat this action in a moment. When you do, you want the spectator to tell you when to stop. Gather the cards and dribble them on the table again. Stop when the spectator tells you to. Oiier to drop off more cards or to start the process again if the spectator wishes. You want there to be no doubt that you stopped where the spectator wanted. When the spectator is satisfied, pick up the supposed selected card, being careful not to flash its lace, and drop it on the tabled cards. Dribble the remaining cards onto it. Instruct the spectator to square up the cards as they lie on the table. Take out the hundred-dollar bill and place it on the table as you explain that you're about to make a wager. Deal the deck into two piles as before. To facilitate counting the cards to know when to deal the bottom, I break up the dealing process. I deal four cards to each pile and then pause and patter for a few seconds. When I resume dealing, I know that, from this point, the fourth card I give myself should be the bottom. All the other dealing before and after this one bottom is iair. In every other regard the effect proceeds and concludes as before.